To cater the varied requirement of the clients, we are betrothed in providing a broad and high- quality assortment ofRotary Printing Screen Spare Parts. These tiller shovel are made from very high quality raw material which ensures high durability. Our tiller shovel widely finds its application garden tools. To cater the varied requirement of the clients, we are betrothed in providing a broad and high- quality assortment of Rotary Tiller Spares. The offered cutter is manufactured using the top class material and advanced machinery. Apart from this, this cutter can be availed from us at the most moderate prices. Owing to our expertise, we are engaged in manufacturing a range of Rotavator & Rotary Tiller Parts that find application in agriculture industry. Known for their robust construction and durability, our range of Rotavator & Rotary Tiller Parts are widely acclaimed by our clients. 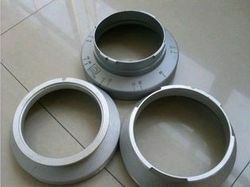 With the association of well-equipped units, we are able to offer premium quality Turret Rotary Spare Parts. The offered product is available in various specifications and as per the requirements of the clients. Available product is made-up by our units from top quality raw material with the assistance of up-to-date technology.